Yes, we are releasing remixes of Max Cooper right after his solo, because we really had a lot of good ones and we did not want to keep them any longer in our drawers and hard drives.So here we offer you a colourful combination of assembled remixes. Some of the originals came out a long time ago like i, Gravities rainbow or Solace from his Metaphysical EP. 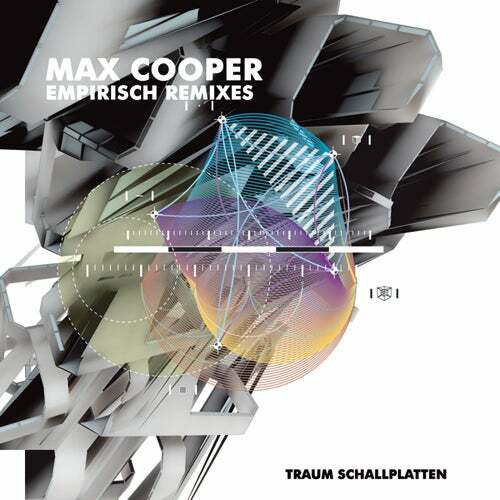 Most of the remixes though refer to the current Max Cooper release the Empirisch EP. We would like to start with UK legend Si Begg. We know Si Begg from the very early Brighton days of 1995 when Riley worked as a reviewer for the Frontpage magazine and did an article about the Brighton electronic music scene. Si Begg is a pioneer of UK techno and electronica and has released so many records... we had to look them up again to set our memory straight.Therefore we are especially happy to have him on board with a remix of Echoes reality. And when we heard his remix we knew he has quality locked in his genes... and Dominik Eulberg said he would play it in his DJs sets since his set consists very much of noodles anyway which he has to unknot or rather knot together to create an Eulberg DJ set. Well Si really brings together different ends in a very dynamic way. His remix consists of: 70ies electronia, 90ies breaks and a production that is state of art. It breathes on different levels... it is obvious he knows very well how to navigate it in his cosmos. Back to Applescal. We have not forgotten the wizard from Amsterdam who handles digital control units like an electronic guitar. Applescal has his magic going into this remix by building up a nice rocking static and then making the strongest and most dynamic musical turn you can imagine. Well it is all techno this time, but still as emotional as his electronic sound on his albums.We asked Moonbeam for an experimental remix of "Echoes Reality" and we think they have not only taken on the challenge but have written an outstanding sci-fi remix, a slow beat monster... with a ghost town like spirit. The Guardner has been making music for over 10 yeas, has released numerous albums and has been responsible for many tracks on the TV show Spacenight which is as important for Techno in Germany as Sven Väth was for the clubbers here. The Guardner has taken Solace and has provided this emotional track with a kind of laid back Larry Heard feeling... connected with a modern production technique resulting is a stunning remix. The remix of Pele (known from Connoisseur) of i is a heavy dubbed out rhythm track, that could be played out by a whole lot of DJs who usually love other genres. So be sure to check out this remix. Mononoid is another signing on Traum and this is their second appearance on the label. The duo unites cultural influence from three different countries and have developed a sound that musically is close to the releases of Minilogue on Traum. Their debut is a stunning epic.Our main artist on our label Zaubernuss: Morris Cowan, feeds the Traum world with his fantastic song writing and shows great skill with his remix of Solace. Ümet Han, based in Cologne has machine drum beats going connected with dark synth sounds that sound a bit like early Human League trax, but all very cool and very moody .Canadian artist Groj has a go on Max Coopers track Echoes reality and comes up with a rich texture of FX sounds and twisted melodies, each second not sounding like the previous one.This remix is tight, hi tech and done with very much precision for everything really.So his remix might be the closest in terms of its characteristics to Max Coopers original. Fans of Max will like this. Avus has been recording for Border Community, Perc Trax and more labels and has remixed here Max Cooper track Gravity's rainbow in his unique fashion of supplying music with a form of understatement that becomes a style in itself. Welcome to Avus way of creating plains out of dashes!